Keisha Scarville, Untitled, 2015-2018. Courtesy Light Work. Among photography’s most cherished powers may be its capacity to memorialize, to encapsulate and preserve memory as a bastion against the long, slow, and malevolent inevitability of forgetting. What comparable experience is there to the one felt by revisiting a personal photograph long after it was made? There is a certain magic in the apparent materialization of past lives or passed loved ones, absences that pictures help to fill. The photograph’s gift is to let us hold on, to re-affirm our past and identity, and to strengthen our relationship to our personal history. 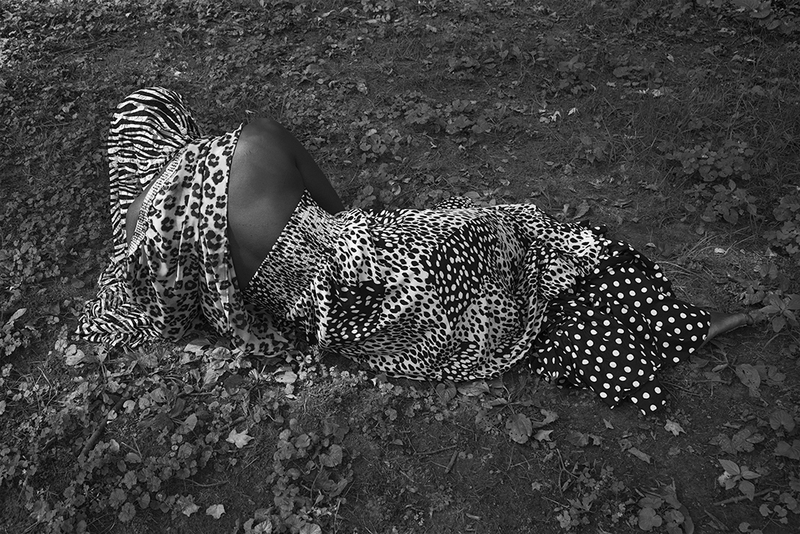 This role of a photograph is the starting point for Alma, Keisha Scarville’s haunting and seductive solo exhibition at Light Work. The show is named after the artist’s mother, who was diagnosed with cancer during Scarville’s 2014 residency at Light Work. 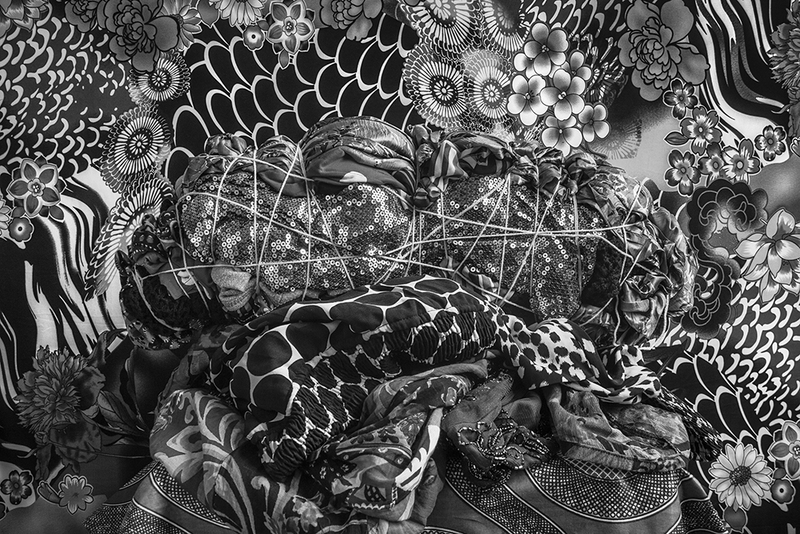 After Alma’s passing in 2015, the artist set out to maintain her mother’s presence by using inherited clothing­—brightly colored and patterned fabrics—as subject matter for photographs. It must seem bittersweet for Scarville to have returned to Light Work for this exhibition, the place where she learned of her mother’s fate. The tension between loss and renewal emerges as a major theme throughout the twelve photographs in the show. Each is defined by an alluring plexus of visual space, patterns overlaid atop patterns, collapsing figure/ground relationships flattened further by withholding color in elegantly formalized compositions. The exhibition is concisely edited to intertwine studio-based still lifes and performative self-portraits. On one hand, still life tableaus reflect a history of Memento Mori paintings, which also tie into photographs’ natural roles as constant reminders of temporality. 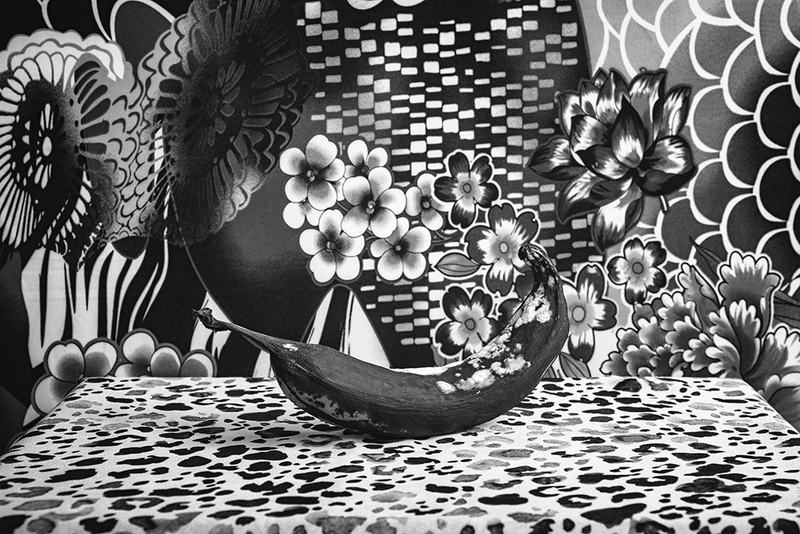 In one piece, a plantain — an ingredient used in many of her mother’s recipes— is aged and growing mold, and placed bluntly upon a tabletop amid a panoply of enthusiastic floral-decorated fabrics. In another, a body-like mass is wrapped in sequined fabric and bound tautly with rope amid further manifold patterning. It reads as a burial shroud, but it’s a picture that could almost be mistaken for a Daniel Gordon tableau had the color not been withheld to turn the boldly complex scene into something more subdued. The natural solemnity of a black-and-white rendered photograph is amplified when the viewer is attuned to how the absence of color fundamentally diverts the picture. Scarville’s aesthetic strategy of withholding color is a sharp and devastating metaphor to describe the pain of loss. It was there, vividly and undeniably, and now it isn’t. Scarville’s still lifes are pictures made with both deep love and sadness, but they also don’t refrain from doubling as playgrounds for the eye to explore and easy invitations for viewers to enter the conversation. They are alluring and seductive pictures that don’t dwell but transform grief and loss into unsurmountable beauty. In this respect, Alma moves beyond the traditions of Memento Mori and enters more into Memento Vitae. The work doesn’t so much mourn as it does celebrate Alma’s life and heritage, maintaining her presence in stasis for as long as the photographs will last. I barely speak figuratively when I state that the soul of the exhibition is found in Scarville’s performance pictures. To look back just a bit, found in the opening decades of the photographic era is a particularly idiosyncratic chapter known as spirit photography. It was a genre of picture-making largely defined by fraud, with trickster photographers using double exposures and chemical development techniques to render ghost-like figures within a photograph. This practice was often marketed to families as a means to conjure and make real the spirits of their dead. Through a combination of broad ignorance of how photography worked and populations of people susceptible to magical thinking, the industry thrived under the guise that a photographer could also be a spiritual medium. Not all photographers explored the idea with commercial or fraudulent intent; it was an activity of casual novelty as well. In many cases, though, viewer ignorance made way to giving credibility to a good hoax. Embedded in the tender remembrances of Scarville’s work is an astonishing legitimization of the notion of spirit photography as a valid genre. In the artist’s self-portraits, she fills the absence of her mother by using her own body as a medium (both the artistic and conjuring type), draping Alma’s clothing over herself, embodying them to create a material form like a ghost wears a bedsheet. Playing off of her use of an aesthetics of collapsed visual space, the embodied figure seems semi-transparent, blending and merging into its surroundings as an impeccable visual simile to an apparition moving through walls. 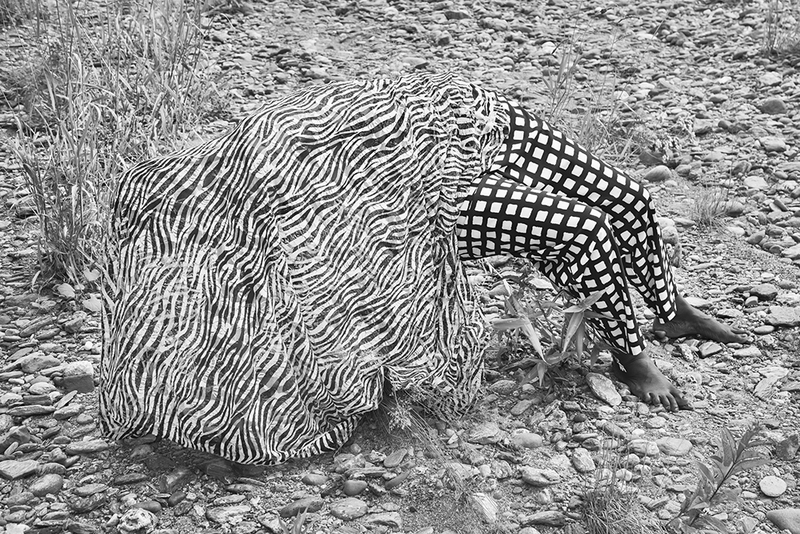 In Light Work’s video interview with the artist, she further alludes to the costumed traditions of Egungun festivals and notions of landscape as a space for narrative. She also gives insight into a sculptural work in the center of the gallery, Mama’s Bones, a touching tribute to a tradition of gift-giving in the artist’s relationship with her mother. In its entirety, the work of Alma intersects innumerable lines of familial heritage and visual tradition, resolving itself as a rich, skilled, clever, touching, and genre-defying display of visual authorship. 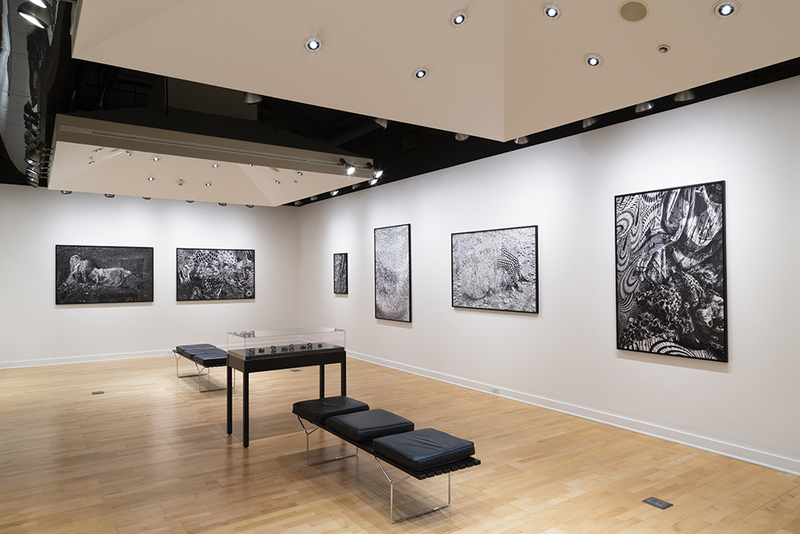 Installation view of Alma by Keisha Scarville. Kathleen O. Ellis Gallery at Light Work. Courtesy Light Work. Alma is on view at Light Work until December 13th. For more information, visit: Light Work and Keisha Scarville.